What Happened to These 19th Century Voyagers? 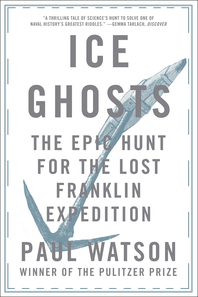 Ice Ghosts weaves together the epic story of the lost Franklin Expedition of 1845—whose two ships, HMS Erebus and HMS Terror, and their crew of 129 were lost to the Arctic ice—with the modern tale of the scientists, divers, and local Inuit behind the recent incredible discoveries of the wrecks. Paul Watson, a Pulitzer Prize–winning journalist who was on the icebreaker that led one of the discovery expeditions, tells a fast-paced historical adventure story and reveals how a combination of faith in Inuit knowledge and the latest science yielded a discovery for the ages. Sales Territory: Worldwide excluding Canada.